I had visited Munich once in the summer of 2002 with my work colleagues, but seeing this strong lineup of space rock and heavy-psych bands made me return to Bavaria once more. Despite the mid-September date, my arrival coincided exactly with the opening of the massive internationally-famous Munich Oktoberfest. OK, this goofy event runs three weeks, so then it *just* makes it into the month of October and that makes the name acceptable I guess. I was told that the hotel rooms would have all been booked up looong in advance, so I accepted the kind offer from ColourHaze bassist Philipp Rasthofer to crash at his flat in the city on Friday night when I arrived. Then for Saturday night, the ColourHaze guys (who were the de facto hosts of the show) also opened up their practice room on the north side of the city, where many travellers from outside were free to come and sleep over after the gig. Naturally, their gracious hospitality was appreciated by us all, and I'm only sorry that I wasn't able to stay long enough on Sunday for the brunch that they'd prepared in addition. I had gotten discount-price train tickets that required me to leave just before that was to start... oh well. There have been quite a few Swamp Room "Happenings" over the last five years or so, I see now, named for the Hannover-based record label and distribution company of the same name. Hannover is too far for me to travel so easily, so it was definitely nice for them to sponsor one down in the 'south' too. Kafe Kult is a typical European non-commercial 'culture house,' not far northeast of the city center in what seemed to be a trailer park of some kind but I was never certain what it really was. The club has a pair of stages, a smaller 'bar' stage that held maybe 80 comfortably and then a bigger room for a couple hundred maybe. My expectation was that this would be a rather intimate affair, but by the late evening, there were over 200 people attending and we were approaching the limit of comfortable viewing, especially in the bar. The schedule was for eight bands to play in a single evening, which I thought at first was overly optimistic, but with the dual stages and effective time management the event went off very smoothly. 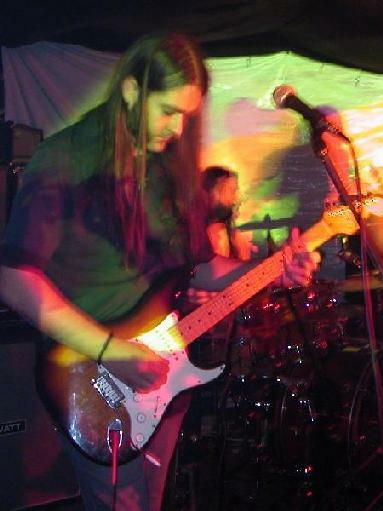 ColourHaze guitarist Stefan Koglek was acting stage manager, or so it seemed, as he appeared anxious and constantly on the move throughout the evening, running back and fourth through the halls to coordinate gear changes and start times. The band Sgt. Sunshine was a late cancellation to the event, given that they had broken up within the month, so Desert in Bloom was recruited as a fill-in for the first slot in the bar. The time management here couldn't have been more exact, as by my watch they went on at 7:00:30 PM. Desert in Bloom were a more straight-ahead rock 'n' roll sort of band, with a rompin', stompin' attitude and occasionally a psych touch to boot. During the song "The End of the Road," the band's keyboardist took over the vocals from the guitarist and this was in my opinion their best song, as I preferred his voice. The bar bands were only scheduled for 30 minutes, but mostly they were given a bit of leeway to finish off with an extra brief finale cut. A good, energetic warmup to kick things off. The Italian 'doom/space' band UfoMammut were up next in the big room, a band that I was previously unfamiliar with even by name. I like both heavy music and of course space rock as well, but it does not necessarily follow that a mixture of the two would work wonders with me. So, while they were pretty entertaining, they didn't rank among my favorites... the aggressiveness of the 'doom metal' sound was a bit too much for me. Thankfully, their songs mostly had a lot of forward motion to them, some guitar riffs being quite energetic rather than the slow, plodding doom-metal that one hears (or avoids) a lot. There was one track near the end where the guitarist and bassist both knelt down and played with their pedal effects by hands, creating a strange experimental noise piece that was actually quite cool and an interesting diversion. UfoMammut also ran their own projected computerized lightshow that I also enjoyed, although the low ceilings were a hazard that were challenging for the visual team to compensate for; they actually did a pretty good job with it. Back in the bar, the Copenhagen trio the Davolinas went on at 8:20 sharp and filled out most of the hour with some throw-back psychedelic rock. They also had a bit of 'attitude' and guitarist/singer Lene had a fairly gritty voice which actually suited the music quite well. I don't know the title, but the 4th song (I think it was) was particularly cool, as it had the 'cosmic conquistadors' sound (as I call it) that I find really cool... go listen to the beginning of Kingston Wall's third album to get what I mean. At the time, I had no idea about the history of the band, but now I read that they share a common history with other Copenhagen psych entities such as On Trial and Spids Nogenhat, which I don't find surprising in the least. It seems that have done some studio recordings, but having suffered a few lineup changes recently, no final product has yet emerged. But it looks like things may be on the right track now for the band to emerge after two years of preparation. The hosts ColourHaze put themselves into the next spot, and sets in the big hall were now stretched out a bit. I had been introduced to them a few years ago through their 'Ewige Blumenkraft' (Eternal Flowerpower) CD and more recently their double-CD 'Los Sounds de Krauts.' Upon my arrival at Philipp's place, I learned that they had just received their newest self-titled effort back from the manufacturer and were going to be featuring some of these new tunes (as well as the CD itself at the merchandising table) on Saturday. The strongest track on the album I think is "Love," and they made a good choice in playing this one live as a lead-in to their finale that was a cover version of the Guess Who's "American Woman." Anyway, ColourHaze has developed quite a unique sound, based on a strong sense of dynamics and a lot of versatility even with just three members. Guitarist Koglek and bassist Rasthofer both like to use the full spectrum of frequencies (i.e., strings) on their respective instruments, and often times it's hard to tell which line is from which instrument. In other words, the guitar and bass 'climb' up and down over each other a lot, which is an effective approach. 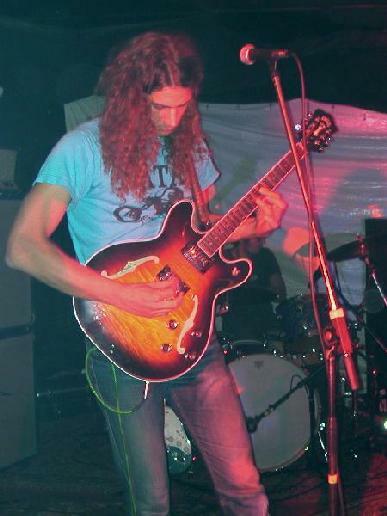 Koglek is a very tall guy (over 2 meters I would guess) and has those long knobby fingers that must be a big advantage for guitar playing, as he can reach places on the fretboard that normal people couldn't. So, although I might be prone to waxing on about their subtle touches, I should at least say also that when the time comes to crank it up and let loose, they do that too without hesitation! Drummer Mani Merwald is also a solid player, able to match the volume level when needed and can do the requisite busy fills during the quieter parts too as on tunes like "Outside," another highlight from the evening. 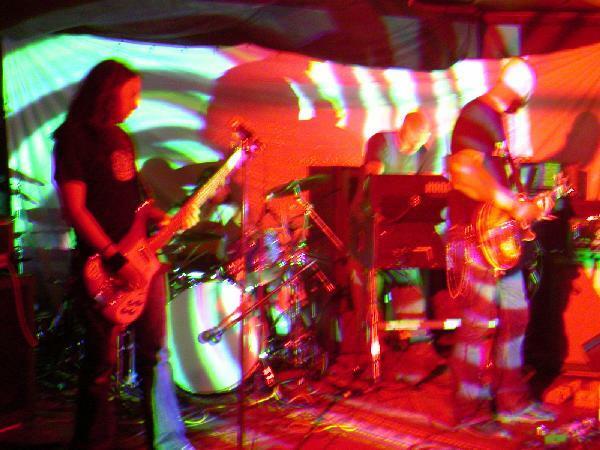 ColourHaze's intro song, "Sundazed," was perhaps the best example of their impressive dynamics, as a long, slow build-up with breathy singing from Koglek finally gave way to an all-out sonic meltdown, the overtone-rich guitar yielding (with a pedal-kick, or flip of the switch?) to a bass-heavy thunderous jam. The other song from the new CD was the epic "Peace, Brothers & Sisters," which went on over 22 minutes in the studio, so I actually think it was quite a bit shorter on this night. By this time of the evening, the audience was maxing out both in number and probably in energy level as well, so the trio came back to play "Almost Gone" as an encore, a song with a bit more bluesy fuzz-guitar riff, reminiscent actually of the Seattle (pre-Pearl Jam) band Mother Love Bone. After their set, I found it too difficult and overwhelming to try to fight my way back into the overcrowded bar, so I largely was unaware of the performances by Ugh! and Color Cacas. Plus, there was the surprise extra bonus of having a pair of CD/vinyl dealers come and set up their wares in the main hallway of the club, in addition to the bands' tables. So without any scheduled break, if I wanted to do some serious shopping (I did), I had to do it then. I was happy to pick up a few CDs that I had been interested in for some time, so that was nice. Anyway, both the bands I largely missed were noisy rock bands, more in a 'proto-punk' tradition than anything else. Color Cacas in particular was the band that sounded like the Stooges, and even their tall, rail-thin guitarist was a bit reminiscent of Iggy Pop, in physique at least. Anyway, Belgium's Hypnos 69 was up next on the main stage, a band that I was briefly introduced to the night before. But whereas Phillip played me some of their earliest music, which had some quite laid-back and spacey moments IIRC, live they were really powerful and energetic. Hypnos 69 is a four-piece, with guitar, bass, and drums, plus another guy on tenor and bari sax, a great space-rock instrument as Hawkwind of course demonstrated 30-odd years ago. These guys have been around for some time, which makes me wonder why this was my first introduction to their music, but some bands just slip through the cracks occasionally. I'm not omniscient exactly. Anyway, the music of Hypnos 69 was fairly complex for psychedelia, perhaps not entirely conducive to catching the average music fan's fancy, but yet I found them still quite fun to hear. Their set list (which I wrote down to check on the songs' provenance) had a good mix of stuff from their last three CDs, the newest ("The Intrigue of Perception") just coming out recently on Koglek's Elektrohasch label. And if my instincts are correct, they finished the night with a cover of King Crimson's "Starless," a tune I must admit to not knowing (and therefore not recognizing by sound), but just now I made note of the song's name (KC had an album by that basic title, yeah?) and could easily imagine them channelling old Crimson. I ended up without enough Euro-cash (just Swiss Francs) at the end of the night to have anything left for Hypnos 69 merchandise, but I think I'll likely be tracking down one or more of their releases soon. I think it was around 1 AM when the final act, Berlin's Liquid Visions, came out to play in the big room. By this time, I was starting to feel the effects of the long day of hiking through the city as well as the King Ludwig dark beers that I had been generously sampling throughout the evening. Luckily, the Swamp Room team had brought in a food vendor that was serving up snacks like sandwiches and ravioli at bargain prices, so at least I was well fed. But then I made myself a bit too comfortable on the bench along the back of the wall as Liquid Visions went on, and to be honest wasn't particularly attentive for the first part of their set. For no reason other than my own tired state of mind. And because my camera battery had died earlier (which is why sadly I have no more photos to offer you), I didn't need to stand up and fight for position up front and that also worked against me. I have been a big fan of the Berlin 'collective' for some time, owning most of the recorded product of Zone Six, Weltraumstaunen, and Lord Brain as well as Liquid Visions themselves of course. Some of my favorite LV stuff is from their newest CD 'From the Cube,' and luckily they played several of the coolest tracks near the end when I had regained a 'second wind.' Bassist Dave Schmidt, who stays active with Zone Six (who I caught just a few weeks later in southern Germany), has now left the band replaced by Erik Haegert. Keyboardist Katja Wolff makes frequent use of the theremin, which I think is a too oft-overlooked instrument by psych and space bands. Hans-Peter Ringholz has a great psych-wah guitar style, and overall the band played with a loud and punchy, but well-balanced, sound all night... and they were tight and well-rehearsed for sure. The songs from the first half of 'From the Cube,' including "What It Is," "Out of this Room" and "To Be Real" were the ones that I think they lumped all together at the end of the performance, when I was really starting to get energized again. Really strong stuff, well written and a great crescendo to top off a great night of sonic psychdelia. I think they must've gone on until about 2:30, which wasn't so terribly late and we still had a good crowd at that point, including those of us preparing for the in-studio camping trip. All in all, the Swamp Room Happening, Munich-edition/vintage 2004, was a great success, and I hope that I can catch one of the big two-day events in Hannover at some point in the future. And I especially appreciate the kindness of Stefan and Philipp for personally making sure my weekend journey was a memorable one.